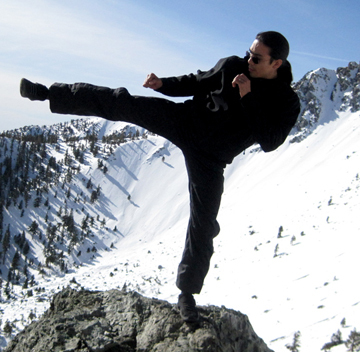 Founder of San Gabriel Valley Jeet Kune Do and Jeet Kune Do University, Nhan is a Traditional Medicine Practitioner, survival and primitive skills instructor, bladesmith, and professional Martial Artist with over 30 years experience in the fighting arts. Descending from legitimate Jeet Kune Do lineages, including Sifu Zee Lo (Ted Wong), Bob Bremer, Tim Tackett, and Jim Sewell, Nhan has been teaching JKD professionally as a certified instructor since 2005. Nhan can also be found at EarthSkyPeople.org where he focuses on preserving ancient skills and wisdom through traditional medicine, bushcraft and wilderness skills, and blacksmithing. 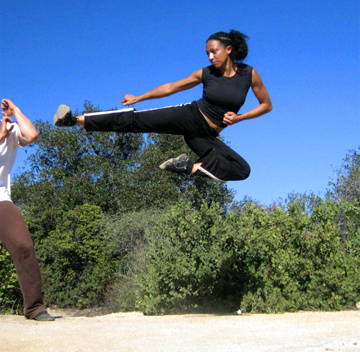 Singer, actress, model, dancer, stunt woman, Superhero, Victoria Vives has a background in Stage Combat, Kendo, Kiryu Kenpo Karate, Wing Chun Kung Fu, Wushu, and is currently studying for instructorship in Bruce Lee’s Jeet Kune Do.